Up for sale is a set of 4 Gorham King Edward Crystal Water / Wine Goblet.Overall Great condition, don't see any flaws. 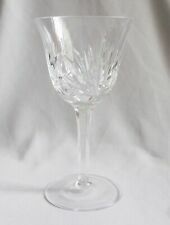 GORHAM LADY ANNE Crystal WINE Glass Goblet 7 7/8” 8 Available! Great Price! WINE GLASS~APPX. 7-5/8" TALL. LEAD CRYSTAL. RARE PIECE. GORGEOUS PIECE! "WILL YOU ACCEPT A LOWER PRICE FOR THIS ITEM?". I HAVE APPX. VERY, VERY EXCELLENT USED CONDITION. WATER GOBLETS IN THE BAMBERG PATTERN. GORHAM CUT CRYSTAL. SET OF FOUR. Wine Glass Goblet Nachtmann Crystal Nierstein (Gorham Cherrywood) 6 1/4"
Nachtmann also made this identical pattern for Gorham as Cherrywood. Pieces are sold individually, so a quantity of one represents one glass. Accent: platinum rim, blue bowl, clear stem & foot. GORHAM CRYSTAL W. GERMANY SET OF 2 GOBLETS WITH FLOWERS ON THE FROSTED STEM. Good condition. 7 3/4 in. GORHAM crystal JOLIE pattern WINE GLASS or GOBLET 7-1/2"
Set Of 2 GORHAM crystal CROWN POINT pattern WINE GLASS or GOBLETS 6"
2 Gorham Crystal "King Edward" Water Goblets 7 1/8", 12 oz Stems Glasses, Exc. Pair of Gorham Crystal "King Edward" water goblets, clean and in excellent condition. Classic design with a round six-panel base, six-sided stem, and a sloped bowl with vertical and criss-cross cut lines. 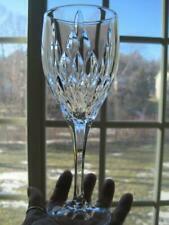 ONE GOBLET FOR WATER OR WINE glass in the Lady Anne pattern from Gorham Crystal. I have shown a few in my photograph. Excellent flawless condition. No dirty newspaper to soil your hands! Up for sale is a Gorham Crystal - Cherrywood Clear - 6 7/8" Water Goblet. This glass would make a nice addition to your stemware collection. Crystal water glasses/wine goblets. Acid etched Gorham on base. Designed in the popular Lady Anne pattern of deep criss-cross and vertical wedge-cut spires. Highly polished to accentuate the brilliant clarity, provide maximum light diffraction and present a beautiful presentation. GORHAM crystal CROWN POINT pattern WINE GLASS or GOBLET 6"
GORHAM crystal CROWN POINT pattern WINE GLASS or GOBLET 6". 4 Gorham Crystal Montclair Platinum Trim Footed Ice Tea Tumblers Goblets 6 1/2"
Item - 4 Gorham Montclair crystal footed ice tea tumblers with platinum trim. Measurements - 6 1/2" to the side edge & 3 1/4" across the top. They hold 12 ounces of liquid when filled to the rim. Markings - Not marked. Condition - No chips, cracks, breaks, cloudiness or repairs. Note - I have more pieces of this pattern available, so please do check out my other listings. 2 Sherbet Glasses - 4 3/8" Tall. 2 Water Goblets - 6 3/8" Tall. Gorham Crystal. 3 Iced Tea Glasses - 6 3/8" Tall. WINE GLASS~APPX. LEAD CRYSTAL. I HAVE APPX. This is a set of three Gorham crystal wine glasses or water goblets in the Cherry Wood pattern. They have a beautiful fan cut design. They are all clear and sparkly. The pictures do not do them justice. Glasses are sold individually, so a quantity of one represents one glass. Glasses still have the original Gorham stickers. 4 Gorham Crystal Rosewood water glasses. Pattern Cherrywood - Clear. Lenox Crystal RADIANCE Water Goblet EXCELLENT. Maker Signed Gorham Crystal. Material Crystal. Country of Manufacture Germany. A condition of "Good" will be followed by a brief note of what the defects are. GORHAM crystal LADY ANNE Platinum WATER GOBLET 7-5/8"
GORHAM crystal LADY ANNE PLATINUM pattern WATER GOBLET. • Platinum Trim. ZEST pattern Water Goblet lot. Goblets are 4 1/4" tall. 1970's GORHAM CRYSTAL. Brown bowl with a Clear Stem. Beautiful pattern. Gorham Crystal Regalta Iced Tea Glass Goblet 8 1/4"
Regalta Discontinued: 1997 - 1999. Iced Tea Glass Goblet. Gorham Crystal. This applies to the continental United States lower 48. One thing that the SFI label indicates is that materials used to make the boxes is from recycled materials. ZEST pattern Water Goblet lot. Goblets are 5" tall. 1970's GORHAM CRYSTAL. Brown bowl with a Clear Stem. Beautiful pattern. It is a Tall Water Goblet. This is the Diamond pattern in clear by Gorham Crystal. Describing previously owned collectibles and antiques is often difficult because condition is subjective. 8 1/2" Tall. Cordial Glass Goblet Nachtmann Crystal Nierstein (Gorham Cherrywood) 3 7/8"
This is a set of 4 beautiful fine crystal water goblets by Gorham in the King Edward pattern. It is designed with crisscross diamond and vertical cuts, and a 6-sided stem. This is high-quality crystal that sparkles beautifully! We will make every effort to get the item to you, wherever you are! Describing previously owned collectibles and antiques is often difficult because condition is subjective. Gorham French Cathedral Crystal Iced Tea Goblet Glass. I have also listed a Gorham French Cathedral Water Goblet. King Edward by Gorham. 6" Wine Glass. Pretty Brilliant Crystal. For sale, this stunning Gorham Crystal water goblet found at aPhiladelphia estate. Signed on bottom (embossed) "GORHAM". Burgundy Wine Glass Goblet Nachtmann / Gorham Crystal Isabella Pattern 7 5/8"
Nachtmann also produced this pattern for Gorham. Pieces are sold individually, so a quantity of one represents one glass. Set of 4 - Gorham Crystal Clear Chancellor Water Goblets - 7"
Set of 4 - Gorham Crystal Clear Chancellor. Water Goblets. Marked Gorham on the bottom. Pre-owned very good condition -. This is a green/smoke colored water goblet in the Accent pattern by Gorham Crystal Germany. The pattern was produced 1969-1974. The condition is excellent used condition with no defects. The price is for one stem. New with labels. Set of 5 gold rimmed water goblets from Gorham. Two boxes of 4 each. GORHAM crystal LAURIN Platinum pattern Iced Tea Goblet or Glass - 7"